An optical fiber is a fine strand of glass (less than 1millimeter (0.04 inch) thick) that is able to transmit digital information in the form of pulses of light. Such transmission is possible because light entering a glass optical fiber is conducted, by reflection, from one end of the fiber to the other without loss of energy. Images may be magnified, distorted, or scrambled, depending on how bundles of the fibers are configured. In medicine, optical fibers have facilitated the development of the endoscope for the internal observation of organs. They also have a widespread application for telecommunications as they are able to carry more information than conventional metal cable systems, providing high-speed links. 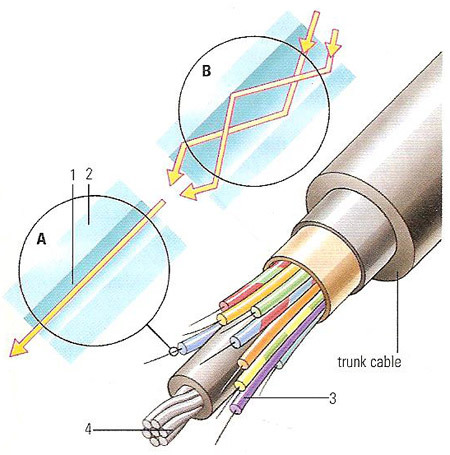 Optical fibers carry information as signals of light. The fibers (see illustration) comprise two layers of the highest quality glass. The inner, glass core (1) of a fiber optic cable is surrounded by an outer cladding of glass (2) of a different refractive index. The cladding contains the light pulses within the core. The light signal cannot leave the core because it always hits the edge of the core at too shallow an angle to escape – an effect known as total internal reflection. A sheath (3) provides physical protection, and bundles of the sheathed cores (trunk cables) are given strength by a central steel wire (4). Narrow-core fibers (A) are increasingly used because they allow signals to be sent over greater distances without blurring. In a wide-core cable (B) more reflections occur, causing the pulse to spread out and merge with adjacent pulses. To prevent this, more space must be left between pulses in wider cables and that limits the volume of data that can be transmitted.